Qatar: Extremist Imam Hassan Qazwini Chief Practitioner of Taqiyya in Doha Debates……. – The Tundra Tabloids……. Qatar: Extremist Imam Hassan Qazwini Chief Practitioner of Taqiyya in Doha Debates……. 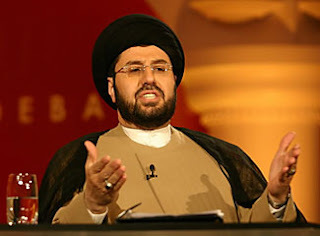 Political commentator and fellow blogger, Debbie Schlussel, has exposed the Iraqi Shia leader in Dearborn Michigan, Imam Hassan Qazwini, as a promoter of Islamic extremism in a number of posts on her blog, Debbie Schlussel.com. Click here, here and here. The man is no “moderate” Muslim leader, no matter how many politicians hands he manages to shake. Imam Hassan Qazwini is …the extremist Imam and friend of President George W. Bush, who runs the largest mosque in North America, the Islamic Center of America in Dearbornistan. In 1998, the mosque–then in Detroit–was the first mosque to which I went undercover. I wrote about it in The Detroit Newsistan, before the paper became Muslim-occupied territory under such boneheaded individuals as editorial page editor Nolan Dhimmi Finley. At the time, the mosque hosted Nation of Islam leader Louis Farrakhan, who delivered a long hate-filled rant against Jews and Christians (and in praise of Saddam Hussein). When Farrakhan called Jewish Americans “forces of evil” with a “Satanic mentality.” Imam Qazwini and his congregants gave him a standing ovation. That’s not to mention that the Imam and other Muslim officials introduced Farrakhan as “our dear brother” and “a freedom fighter.” Imam Qazwini is also tight with Hezbollah spiritual leader, Sheikh Mohammed Hussein Fadlallah, who issued the fatwa to blow up 300 U.S. Marines and embassy officials in 1983. Qazwini is tight with the Ahmadinejad government of Iran and is an open supporter of Hezbollah, HAMAS, and every other terrorist group you can think of (though he claims–like they all claim–that he is against Al-Qaeda). So imagine the Tundra Tabloids surprise when it came across the video of the al-Beeb’s Doha Debates, in which Imam Hassan Qazwini was included as a guest member of the panel. The topic of the debate was: ‘This House believes the Sunni-Shia conflict is damaging Islam’s reputation as a religion of peace.’ Most noticeable was the guest panel’s flagrant use of taqiyya, (Muslim for religious sanctioned lying) from both the Muslims and from the token non-Muslim panelist, Juan Cole himself! Perhaps in Cole’s case he can be depicted as just being an intellectually dishonest lying turd of a Leftist pseudo professor. But lets move on shall we? The chief dissembler on the panel by far, was none other than Imam Hassan Qazwini, who was fielded the following question from a man who actually thought he was going to get a straight, honest answer from the extremist religious leader. Heh heh heh….wrong. Question to Qazwini: Imam Hassan Qazwini mentioned before that there are some minoristic groups of Shia and Sunni, they are fighting, creating conflicts around the world, I mean in different parts of the world. My question is that of, why, who are they, and how can we bring these people, these groups to courts of discussion, to a peaceful environment? Qazwini: I believe that these are extremists, these are the “Takfiris” (points to Hisham Hellyer, Fellow, Oxford Centre for Islamic Studies who first mentioned the term), the fanatics, people who just basically disagree, who launch war against anyone who disagrees with them. And this is not between Shia and Sunnis only. People who were killed last month in Algeria, they were not Shia, They were Sunnis. People who were killed in Cairo, in Istanbul, in Jakarta, these people were Sunnis. These people were killed simply because they disagreed with these fanatics, and unfortunately these fanatics do not know no other language than the language of violence. And this is a problem that we face, I do not deny that there is a problem in the Muslim world, but I’m trying to say that these people do not speak for the majority of Muslims, they speak for themselves. Now remember dear readers, this is an Imam who is “buds” with the chief spiritual leader of Hezbollah, a terrorist organization that murdered Jews in Argentina, launched thousands of rockets on Israeli civilians, as well as being an open sympathizer of Hamas, the other terrorist organization that loves to murder Jews, and wants to institute the jizya “poll” tax on its Christian minority. This is the kind of “moderate” that the west falls for time and again, in spite of proof in existence that they are indeed extremists….not moderates/modernists. It was disgusting to see the same individual condemn “extremism”, though he is fully on record that he supports extremists like Hamas and Hezbollah, and can only mean that his condemnation of al-Qaida and other jihadi groups around the world is a disingenuous one. So forget about the label of “moderate”. Thanks to Debbie Schlussel for keeping a close tabs on this IslamONazi. Previous Post Previous Post IslamOfashion Hits The Streets of Europe……! Next Post Next Post Shocker, Jewish Symbols Stolen Again……. !